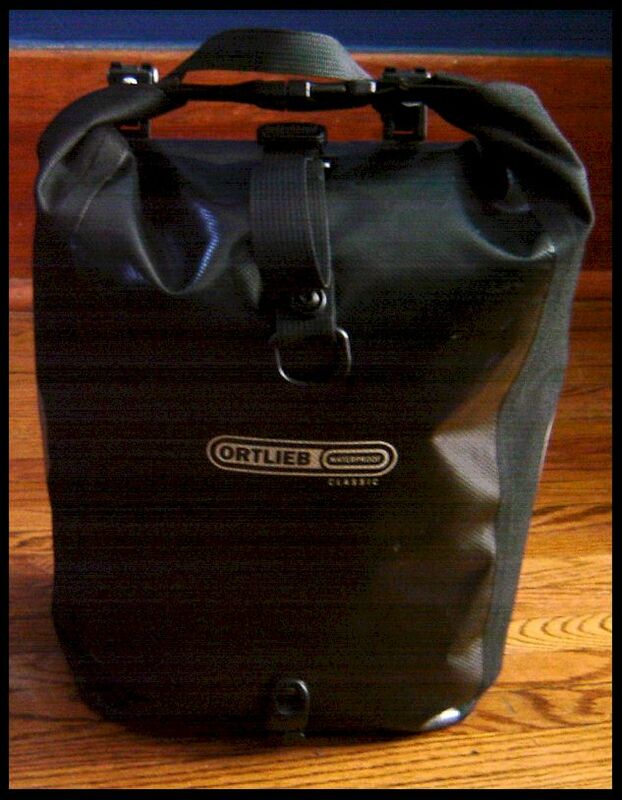 I love my Ortlieb panniers. I've got a pair of front roller classics that I use on my rear rack. They're great, as I've noted a couple of times in a review post. 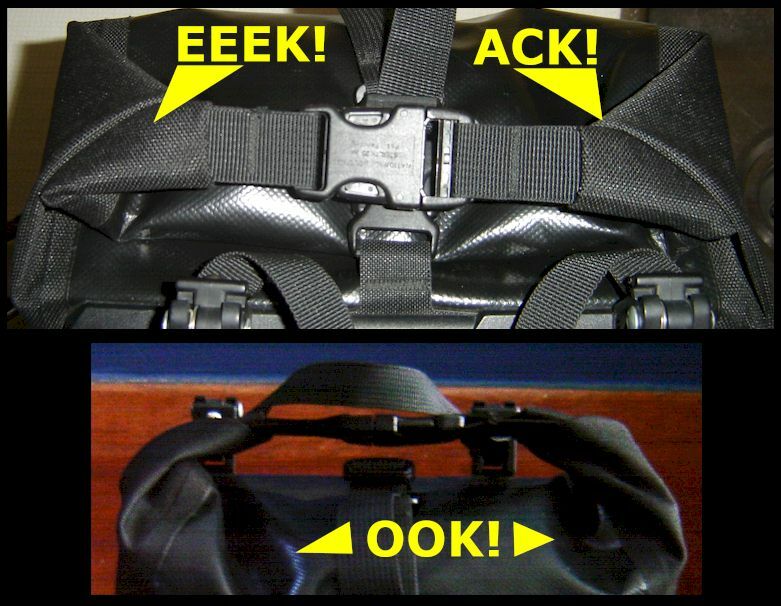 I have discovered, however, that I am not alone in having a bit of a peeve with the shoulder/"pull down" strap. 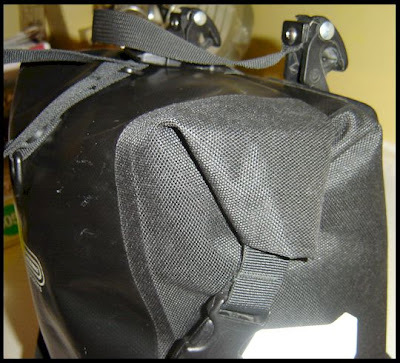 After using the pannier for a couple of months, I removed the plastic/rubber shoulder pad thing because it got in the way of adjusting the strap length sometimes. 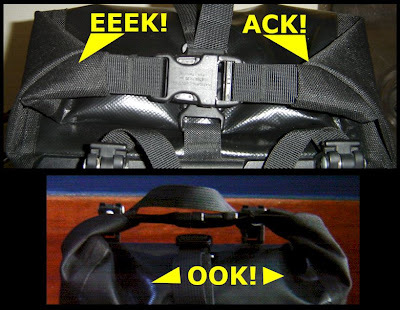 In addition, I seemed to always be in danger of losing the strap, so I took to leaving one end of it connected at all times, including when I was rolling and unrolling the top. It wasn't a big deal, but it was just slightly annoying, as was adjusting the strap length depending on how full the pannier was. First, I assembled some aluminum sleeves (crimps), shock cord and pull-adjuster things. This assembly would replace the strap with something I could stretch and/or adjust the length of very quickly and easily. 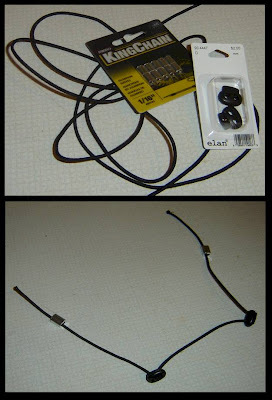 Second, I looped the shock cord through the roll-top ends and pounded the aluminum sleeves flat. Done! Third, I tried it out. Fourth, I cut my contraption off the pannier because it was hopeless. I knew the cord might get in the way somewhat while rolling the top, but not as badly as it did. My hack attempt was ill-conceived and totally sucked. That's OK though, because it will inform any further attempts I make. Please note that I would have tidied up those frayed ends if it had worked. I'm cooking something up in my brainpan right now, so please refrain from advising me. I'm stupid, but I am also determined. Overcoming stupidity without help from smart people is just so much more satisfying, don't you think? Only answer that if you are stupid too... I guess you did just spend a few minutes reading this... Yep, you can answer. * please note that said love is of the variety with which you are most comfortable and may include "like a brother", "in a non-creepy way" or "you know, as a friend" types. Especially if you are a dude. PS - I revisited this "problem" with better results later on. Click here for that post. I have a set of back roller plusses. I don't use the shoulder strap, and I click the short pieces on top. I never considered that that might cause a problem, and for me, it never has. However, we had a huge drought start ... hmm, now that I think of it, probably right around when I got new waterproof panniers. *gasp* Am I responsible?? Apertome - I don't think it will cause a problem either. I'm just finicky. 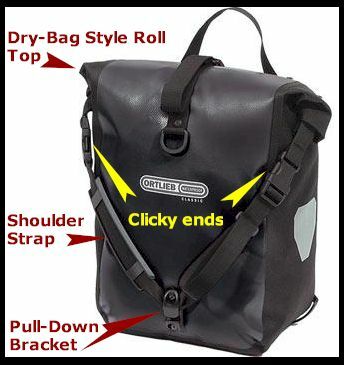 If you did cause the drought by getting waterproof panniers, might I suggest throwing away your wallet? I busted out laughing as soon as I read your response. Thanks, I needed it today! Looking forward to your next hack. I imagine that it will be an epic work of staggering genius (or, at least, 'purty good').